Leading Exporter of 2 tier trolley from Ahmedabad. 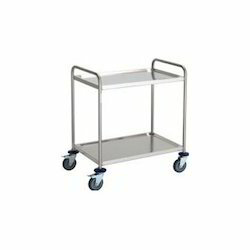 Our company is among the leading names in industry, engaged in supplying, trading and retailing a large array of 2 Tier Trolley. These trolleys are designed in such a manner that they can be easily moved to carry the good or food items from one place to another. Due to their high load capacity, excellent strength and longevity, these trolleys are broadly demanded all over the world.